In a somber remembrance ceremony filled with prayer and song, Georgetown University asked for forgiveness and took new steps to right a nearly two-hundred-year-old wrong on Tuesday. Speaking on behalf of the school's founding fathers, Rev. Timothy Kesicki, president of the Jesuit Conference of Canada and the United States, began the morning service offering reconciliation to the descendants of 272 women, men, and children sold into slavery to pay off school debts and keep the school afloat in 1838. More than 100 descendants of the honored slaves attended the ceremony. Sandra Green Thomas, who wore a green ribbon in honor of her ancestors, was among them. Following the liturgy, the university dedicated two campus buildings in remembrance of the slaves who were sold to a Louisiana plantation in 1838. Originally named Mulledy Hall and McSherry Hall — after the Jesuit school presidents who brokered the sale — the buildings were officially renamed Isaac Hawkins Hall and Anne Marie Becraft Hall. Hawkins, a 65-year-old enslaved man, was sold to the plantation along with his family. Becraft was a free black woman who started a school for black girls in Georgetown in 1820 at only 15-years-old. She later joined the Oblate Sisters of Providence, one of the nation’s first African American Roman Catholic sisterhoods. Taking the name Sister Mary Aloysius, she became one of the country’s first black nuns. The dedication ceremony, led by Georgetown president John DeGioia, included current Georgetown students and administrators as well as descendants of Hawkins and Becraft. 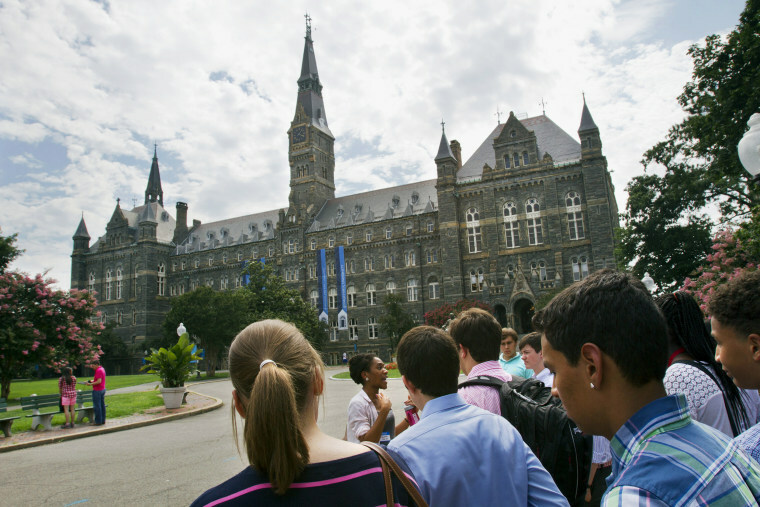 After a number of colleges have been pressured by their student bodies to rename buildings in recent years, the dedication at Georgetown felt like a step in the right direction for some students. “When students, present and future, come to know Isaac Hawkins, they will come to know Georgetown’s past,” said Connor Maytnier, student member of the Working Group on Slavery, Memory and Reconciliation. It was no coincidence that the ceremony occurred after the Easter holiday weekend and two days after D.C. Emancipation Day, the day over 3,000 slaves were freed in the district in 1862. The effort to rename the halls came in 2015 after the Working Group on Slavery, Memory and Reconciliation brought the names to attention. After backlash from student groups, the university decided it was time to take action. In September 2016, DeGioia apologized for the slave sale and announced plans to offer admission advantages to descendants of the slaves. “Our communities are given shape by our histories, by the values, traditions, memories that we inherit. History is alive for us at every moment. We are just one community, but right now every community is asked to look deep in themselves and to find the very best of which they are capable,” said DeGioia. The university has events taking place throughout the week to honor and remember the slaves.